In the last several years there had been a considerable advancement in treating highly complex melanoma, but to treat cancer that affects more people each year had been a great challenging task yet. In past years cancer continues to be a serious issue, with unmet requirements high and the number of cases rising. In such serious and complicated circumstances, the Zelboraf becomes a novel option for individuals with BRAF mutation-positive advanced melanoma. Zelboraf (Vemurafenib) is the subsequent drug permitted for late-stage melanoma after Yervoy (Ipilimumab). Vemurafenib is also identified by its trade name Zelboraf. Melanoma is not common but is one of the deadlier, more antagonistic forms of skin cancer. Early detection of melanoma can be cured if treated timely but when the disease turned to advanced forms of cancer it is comparatively risky to cure the melanoma completely. Considerable steps have been made in treating metastatic melanoma, giving patients a number of options to think. Zelboraf (Vemurafenib) is helpful to treat metastatic melanoma (skin cancer). Zelboraf (Vemurafenib) is particularly indicated for patients whose tumors express a BRAF V600E mutation, the protein that helps melanoma tumors grow. The cobas 4800 BRAF V600 Mutation Test helps to determine if the melanoma cells contain the indicated mutation. Zelboraf (Vemurafenib) is a type of cancer treatment called a cancer growth blocker. Zelboraf (Vemurafenib) is a BRAF inhibitor that blocks the function of the V600E-mutated BRAF protein which can stop the melanoma cells from growing and dividing. Most patients taking Zelboraf (Vemurafenib) bear the drug well. 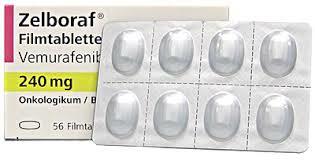 The fact that the drug does not block normal BRAF means that its effects on healthy cells of the body are small. However, some side effects do occur. Zelboraf (Vemurafenib) also has significant side-effects, including a second, less serious form of skin cancer called basal cell carcinoma, which is uncomplicated and can be treated. Common side effects may include joint pain, tired feeling, nausea, hair loss, mild rash or itching skin growths or blurred vision, increased the sensitivity of your eyes to light. Headache with chest pain and severe dizziness, fainting, fast or pounding heartbeats;Signs of inflammation in your body–swollen glands, flu symptoms, easy bruising or bleeding, severe tingling or numbness, muscle weakness, new or worsening cough, trouble breathing, liver problems, upper stomach pain, tired feeling, loss of appetite, jaundice or severe skin reaction, fever, sore throat, swelling in your face or tongue, burning in your eyes, followed by a red or purple skin rash(especially in the face or upper body) and causes blistering and peeling. Before you start treatment, your doctor may perform tests to make sure Zelboraf (Vemurafenib) is the best treatment for your type of skin cancer. Also tell healthcare provider about the medical conditions, allergies, and all medicines you use. Many drugs can interact with Zelboraf (Vemurafenib), including prescription and over-the-counter medicines, vitamins, and herbal products. Follow all directions on your prescription label. Do not take this medicine in larger or smaller amounts or for longer than recommended. To make sure this medication is not causing harmful effects; your skin condition will need to be checked often. Your heart function may also need to be tested with an electrocardiogram (ECG or EKG) on a regular basis. You may also need eye exams. Your cancer treatments may be delayed based on the results of these tests. The recommended dose of Zelboraf is 960 mg, four 240 mg tablets two times a day, 12 hours apart. Take Zelboraf (Vemurafenib) with a full glass of water. Zelboraf (Vemurafenib) may be taken with or without food, but should not be taken on empty stomach repeatedly. Do not crush, chew, or break a Zelboraf (Vemurafenib) tablet. Swallow it whole. While using Zelboraf (Vemurafenib), you may need frequent blood tests to check your liver function. Price has been a tentative obstruction in consuming effective drugs for patients that need them. Zelboraf (Vemurafenib), like all new, targeted treatments, is expensive. As the suggested Zelboraf dose is 960mg (4 x 240mg tablets) taken twice. The cost per 240mg tablet is $46.54, so have an everyday cost of $372 and an annual cost of approximately $136,000. The genetic mutation test cost from $120 to $150. The Scottish Medicines Consortium recommended the use of Zelboraf (Vemurafenib) as the first treatment for melanoma that has spread to other parts of the body or can’t be removed by surgery. Usually, Zelboraf (Vemurafenib) can be taken for as long as it controls the melanoma.